Home > News > KC Updates > All digital-only volume 1s now 99 cents—ends September 20! Welcome back to School Rumble … we mean it! 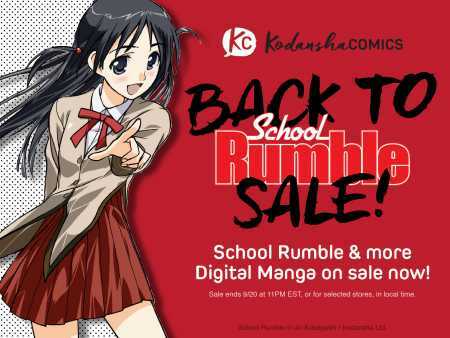 We're putting 17 digital volume 1s—not just School Rumble—on sale for 99 cents each! Get into any of our digital-only series, including the exciting "Kodansha Resurrection" titles we're bring back from out of print. Visit our digital retail partners—at comiXology, iBooks, Kindle, Kobo, and nook—through September 20 (11pm Eastern Time) to get started.